Thanks to Zoltan (aka Veryokay on YouTube) for submitting information about his Inmarsat STD-C EGC live stream setup. His setup allows him to access the Inmarsat STD-C signal from anywhere in the world over the internet, thanks to the use of an OpenWebRX server. Inmarsat STD-C is a geostationary satellite service that provides information for search and rescue, as well as news, weather and incident reports for mariners. We have a tutorial from a few years ago which shows some example messages. OpenWebRX is an efficient SDR streaming server platform that allows you to access RTL-SDR's and other SDRs from anywhere in the world via an internet connection. In his setup Zoltan uses a Raspberry Pi 3, RTL-SDR Blog V3, L-band LNA and L-band antenna for receiving and processing the signal. Power is provided via a Power over Ethernet (PoE) adapter, and the whole thing is placed outside, in a weatherproof plastic lunchbox. The video shows the hardware, and then goes on to describe the software setup, along with a demonstration of the OpenWebRX stream. More information as well as the link to his publicly accessible OpenWebRX Inamrsat STD-C stream can be found on his blog post. Over on Kickstarter a retrofit PCB for RTL-SDRs called Soft66IP has appeared for crowd funding. The PCB includes a 50 MHz upconverter and RF amplifier on board and incorporates space to plug in an Orange Pi Zero single board computer, and an RTL-SDR. The project is by Kazunori Miura who is the creator of the Soft66 range of RTL-SDR retrofit products. The kickstarter appears to be for the "Soft66IP", which has been around since early 2017. The main difference appears to be that now OpenWebRX is preloaded on the SDCard, and that there is a custom script running on the Orange Pi Zero which allows you to choose between OpenWebRX and HDSDR. Presumably clicking on HDSDR runs an rtl_tcp server, which can then be connected over the network. The idea is that this system will be used together with software like OpenWebRX, which would enable the RTL-SDR and radio stream to be accessed online from anywhere in the world via an Ethernet connection. Examples of OpenWebRX receivers can be found on sdr.hu, just search for "RTL-SDR" on the page to find relevant examples. There are several support options, with the main board (without Orange Pi Zero or RTL-SDR) starting at US$22, and US$88 for the main board including RTL-SDR, Orange Pi Zero, enclosure and SD card. The system could probably be home built for much cheaper, but there is a convenience in purchasing a ready to use system. Although if you're interested in HF and want an internet connected SDR, then you might be better off shelling out for a $299 KiwiSDR instead, which is also an OpenWebRX based SDR. Soft66IP: Main board + RTL-SDR + Orange Pi Zero. GitHub user unixpunk has been working on a custom firmware image for the PlutoSDR called 'PlutoWeb' (more info available on their website as well). The firmware allows you to run a web interface on the PlutoSDR and this allows you to run server programs such as OpenWebRX, Dump1090 and streaming servers like SoapyRemote. Because the PlutoSDR has a built in processor, this firmware can turn the SDR into a fully standalone device. The PlutoSDR is an Analog Devices $99 RX/TX capable SDR with 20 MHz of bandwidth and a 325 MHz to 3.8 GHz frequency range that is software hackable to 56 Mhz of bandwidth and a 70 MHz to 6000 MHz frequency. It has an on board Xilinx Zynq Z-7010 FPGA, which has a built in dual core ARM Cortex-A9 processor as well. It has been out of stock for a while, but was recently restocked and can be purchased directly from Analog Devices, or via Arrow, DigiKey or Mouser. If you're interested we previously did a review on the PlutoSDR, and have notes on enabling the software hack and setup available on this blog. 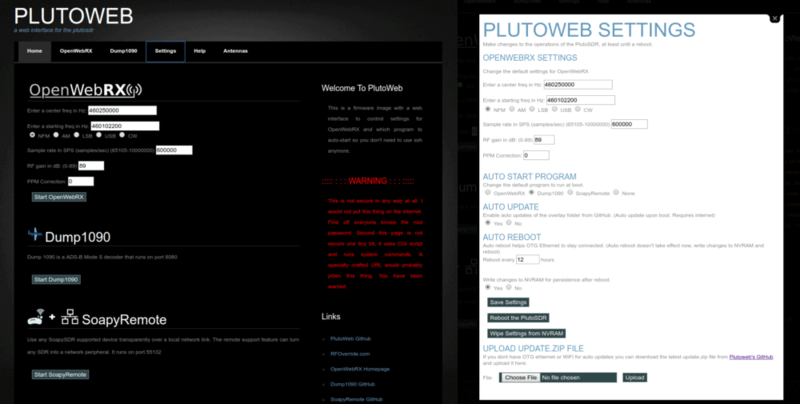 PlutoWeb Web Interface Running on the PlutoSDR. Thanks to Stefan Dambeck for letting us know that there is now a fork of libairspyhf made by DL9RDZ which contains an adapted version of airspyhf_rx (the raw IQ generator). This enables the Airspy HF+ to be easily integrated into OpenWebRX. 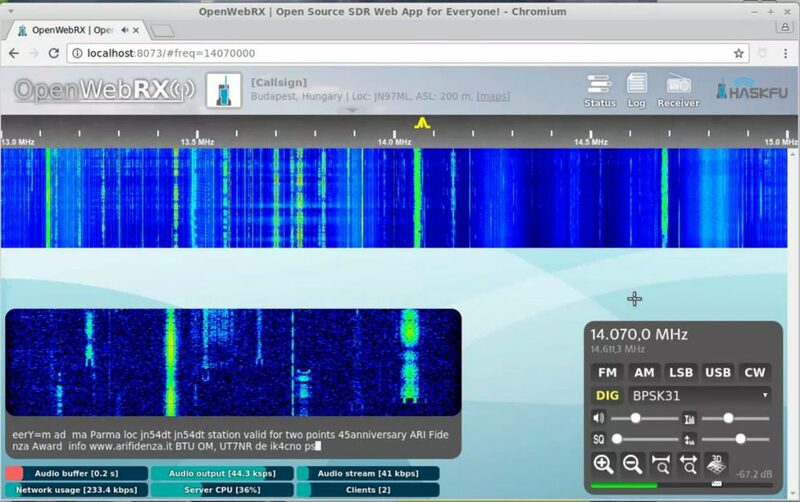 If you weren't aware, OpenWebRX is a browser based SDR interface and server software that allows an SDR to be used by multiple people at the same time over the internet. It performs audio demodulation and compression on the server side allowing for very low and efficient network usage. In this way it is different to Airspy official server solution SpyServer which sends the IQ data over the network. So an OpenWebRX server uses significantly less network bandwidth and might be more suitable for those on slower or capped internet connections. At the moment we're not seeing any public HF+ servers available on the OpenWebRX database at sdr.hu, but this may change in the future. OpenWebRX has recently been updated and now includes a 3D waterfall display and a BPSK31 demodulator. OpenWebRX is a popular program which allows you to stream an SDR like the RTL-SDR over the internet efficiently. A number of clients can connect to your server and tune anywhere within a predefined bandwidth. Many examples of OpenWebRX running on RTL-SDRs and KiwiSDRs can be found on sdr.hu. The 3D waterfall is quite an interesting feature as it allows you to visual signal strength, frequency and time all at once. BPSK31 is a popular amateur radio digital mode for making QSO’s (contacts). 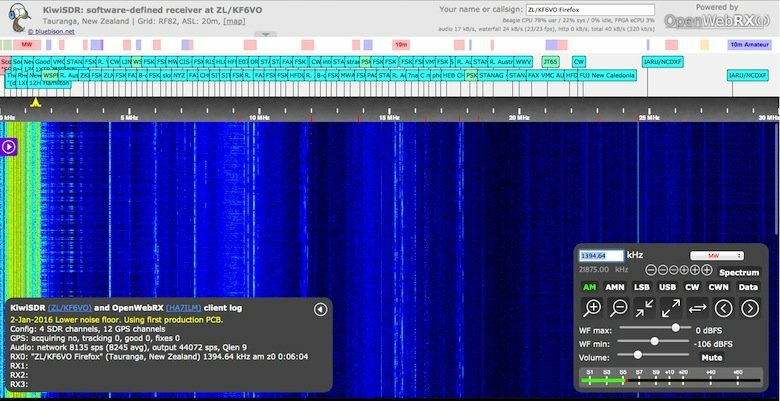 The new decoder allows you to zoom in closely on the band with high resolution and select with the mouse which BPSK31 channel you’d like to decode. András Retzler, creator of OpenWebRX also writes that he’s now completed his Masters Thesis (congratutions!) on the topic of “Integrating digital demodulators into OpenWebRX”. His thesis is available for download here and looks to be an interesting read. 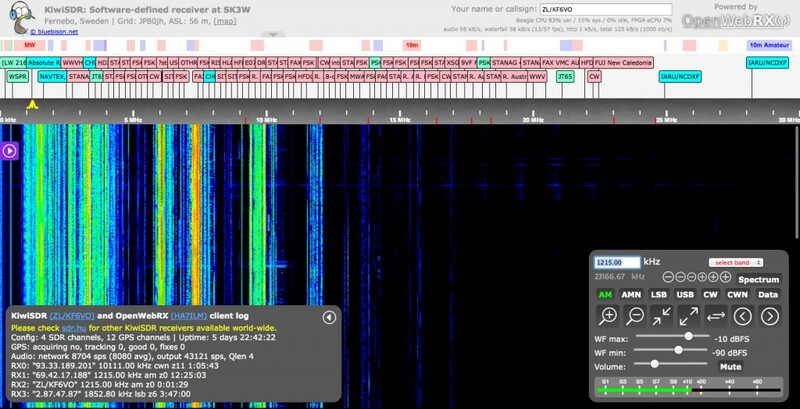 Back on February 8 we posted about the up and coming KiwiSDR, a software defined radio with 30 MHz of bandwidth and a tuning range that covers 0 – 30 MHz (VLF to HF). It is intended to be a low cost web based SDR that can be accessed from all over the world via a browser interface. The KiwiSDR is designed as a cape for the BeagleBone Black mini embedded computer, and uses a LTC 14-bit 65 MHz ADC and Xilinx Artix-7 A35 FPGA. 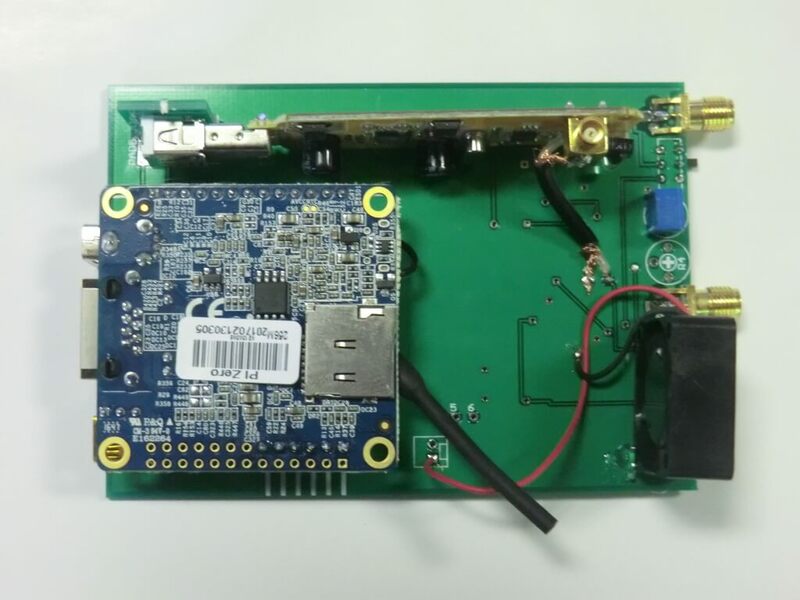 It also has an integrated SDR based GPS receiver which is used to automatically compensate for any frequency drift from the main 66.6 MHz oscillator. It runs on the OpenwebRX web based software, which many RTL-SDR users have already been using to stream live radio to the web. Sure, the world doesn’t really need another SDR. But we haven’t found one with this set of features. In cost and performance, KiwiSDR fits between RTL-SDR USB dongle-style, or fixed DDC chip devices ($20 – $400, 8-12 bit ADC, limited bandwidth), and full 16-bit SDRs ($700 – $3500) while offering better wide-band, web-enabled capabilities than the more expensive SDRs. Our main motivation is to enable new applications which utilize a significant number of programmable, web-accessible SDRs world-wide. Direction finding remains one of the great under-solved problems of shortwave listening, particularly for utility stations. Given the GPS timing available on the KiwiSDR, could time-of-arrival techniques between cooperating SDRs be used? We’d sure like to find out. Also, we’d like to see data decoders built directly into the web interface of KiwiSDR. There are many standalone programs that demodulate and decode data signals from SDRs. But these are computer- and OS-specific and often require a complicated interface to the data stream from the SDR. For example, we have a prototype of a WSPR decoder that is integrated into the KiwiSDR interface. KiwiSDR Running on OpenWebRX. Full 0 – 30 MHz spectrum. 100% Open Source / Open Hardware. Includes VLF-HF active antenna and associated power injector PCBs. Browser-based interface allowing multiple simultaneous user web connections (currently 4). Each connection tunes an independent receiver channel over the entire spectrum. Waterfall tunes independently of audio and includes zooming and panning. 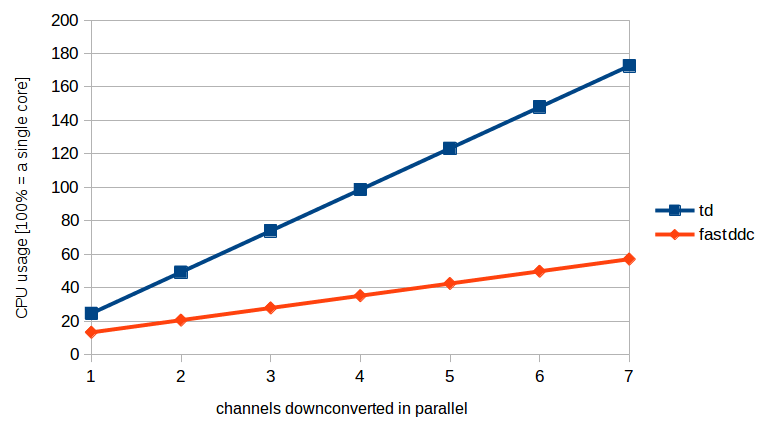 Multi-channel, parallel DDC design using bit-width optimized CIC filters. Good performance at VLF/LF since I personally spend time monitoring those frequencies. Automatic frequency calibration via received GPS timing. Easy hardware and software setup. Browser-based configuration interface.